Jared Golden and his wife, Isobel, after he was announced the winner of the race. Golden, a state legislator and combat veteran who served in the U.S. Marines, defeated Republican Bruce Poliquin after being lifted to victory by Maine's landmark election law. The results capped a white-knuckle race that was marked by big spending, lawsuits and yet another legal test for ranked-choice voting. Campaigns and outside groups spent over $20 million on the congressional seat that now belongs to the 36-year-old Golden. The money reflected the high stakes for national Democrats, who now have firm command of the U.S. House of Representatives for the first time in eight years. a state legislator and combat veteran who served in the U.S. Marines But in contrast to all the drama and national attention surrounding Maine's ranked-choice voting law, Secretary of State Matt Dunlap's historic runoff announcement was rather understated. 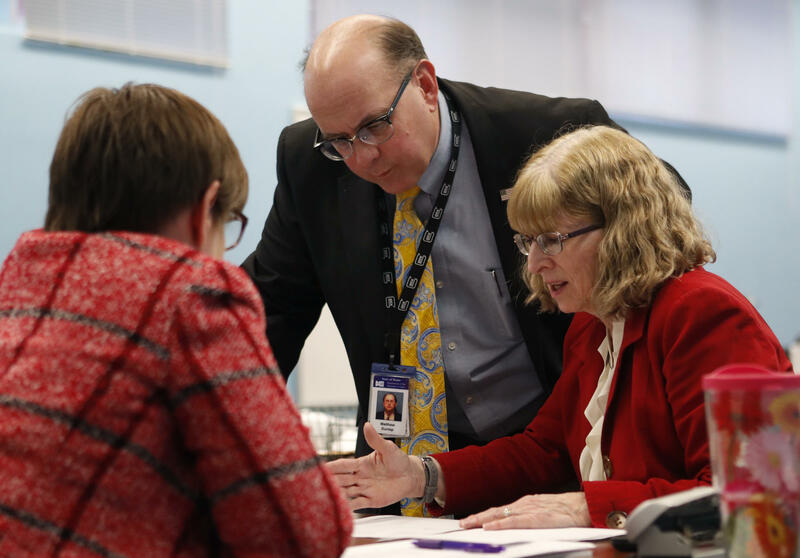 Maine Secretary of State Matthew Dunlap and Deputy Secretary of State Julie Flynn, during the ballot-tabulation process on Tuesday. In contrast to all the drama and national attention surrounding Maine's ranked-choice voting law, Secretary of State Matt Dunlap's historic runoff announcement was rather understated. That single woot from a woman observing the count was the most expressive reaction of the afternoon. And Golden himself remained low key, at least publicly. As he addressed a forest of television cameras at an office near the state capitol, he used the same self-effacing demeanor that became a hallmark of his public appearances, a stark contrast to the flood of breathless television ads that swamped 2nd District voters beginning in August. He thanked his campaign team and his wife Isobel, then shifted to his priorities to Congress, where he will join a diverse and young class of Democratic freshmen. Golden also vowed not to fall into the trap of other House members whose focus on the next election often begins before they're sworn into office. "I'm not playing that game. I'm not going to be a part-time congressman, I'm town halls, not just fundraisers. And I won’t be calling lobbyists and corporate PACs to dial for dollars, or to trade my votes for their contributions," he said. Golden's margin for victory was just one percentage point, or about 3,000 votes, and it was made possible by Maine's ranked-choice voting, a system that allows voters to rank candidates in order of preference. In this case Golden was the beneficiary of second- and third-place rankings from voters who picked independents Tiffany Bond and Will Hoar as their first choice on Election Day. Thursday's runoff was the first to determine the outcome of a federal race, and became the focus of a legal challenge filed by Poliquin earlier this week, declaring that it violates the U.S. Constitution. He restated the claim during a video message from his congressional office on Thursday. 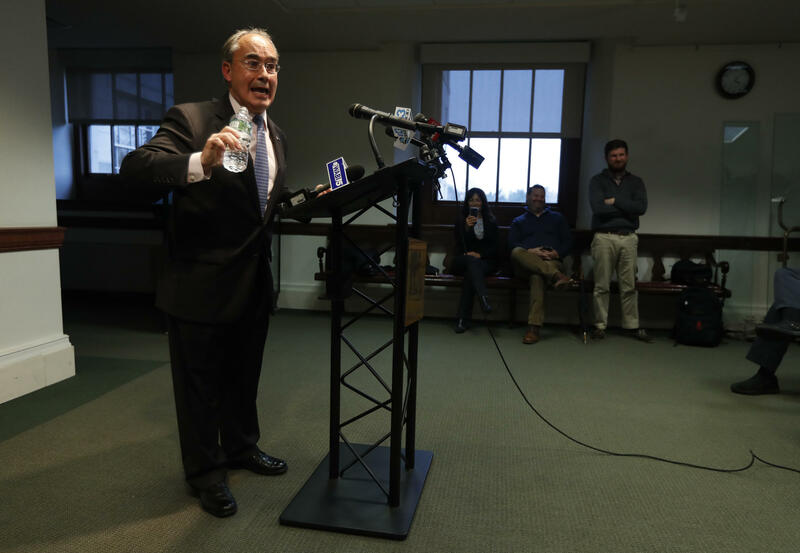 Poliquin speaks at a news conference Tuesday. Thursday's runoff became the focus of a legal challenge filed by Poliquin earlier this week, declaring that it violates the U.S. Constitution. And it would have been over under Maine's traditional plurality system, in which the candidate with the most votes wins. But ranked-choice requires a candidate get more than 50 percent of the vote to be declared the outright winner. Short of that ,the instant runoff system comes into play. Poliquin’s legal team sought to halt the runoff by seeking a temporary restraining order on Wednesday just as state election officials were finalizing the painstaking process of gathering and scanning ballots. Legal scholars were skeptical of Poliquin's challenge and, apparently, so was U.S. District Court Judge Lance Walker. Not only did Walker deny Poliquin's restraining order, his 16-page ruling disassembled several of the Republican's key claims about ranked-choice. Poliquin, who was in Washington during the runoff, was not made available for interviews. In a written statement, he did not address Walker's restraining order ruling, only that he planned to continue a legal challenge to what he called "the constitutional concerns about the rank vote algorithm." Golden, meanwhile, largely stuck to the script that made him competitive in a district that President Donald Trump won decisively two years ago. When asked if he planned to support Democrats' attempts to investigate the president and his administration, he said it wasn't a priority. "I think all leaders need to be held accountable, and that includes every single leader that we have in this country, but beyond that, not my top focus," he said. And, like other freshmen Democrats who attempted to thwart a key Republican attack line, he vowed to honor his campaign pledge to vote against California Democrat Nancy Pelosi for House Speaker — and from the House floor if necessary. "With all due respect to the hard work she's done for many years, I believe it's time for new leaders in this country," he said. Asked who he might support instead of Pelosi, Golden mentioned a fellow combat veteran: Massachusetts Congressman Seth Moulton. Moulton hasn't said if he's challenging Pelosi, but he is waging a campaign to block her from becoming speaker. If he does enter the race, he'll apparently have the backing of Golden, who Moulton endorsed almost exactly one year ago. The nation’s first ranked-choice voting runoff will take place at noon Thursday at a counting facility in Augusta.